I used to hate writing story openings. I could never find the right spot the first time around. Sometimes, I started too far into the current story, leaving readers scratching their heads and squinting as they tried to figure out what the heck was going on. Other times, I started too early—well before the current story began, and readers yawned as they slogged through backstory dumps or long passages where nothing important was happening. I know I’m not alone in this; it’s a common problem I see when critiquing first pages. But I’ve found a few tricks for finding that sweet spot so it doesn’t come too early or too far into the story. First, it’s typically best to begin the story in medias res. I can’t remember who first coined this term in regards to writing, but it’s a gem. When you’re starting a story, you want to begin in medias res—“in the middle.” What this means is that you want to start your story once it’s already underway. Readers pick up a book because they want to get lost in it right away. They want the characters on page one to be the ones they’re going to get invested in and become attached to. This is best achieved if they start reading in the middle of the character’s current story. And…where would that be? To find that sweet spot, look at your story as a whole and consider the first two parts of it. Blake Snyder (Save the Cat) calls these story parts beats, so I’ll go with that terminology. The first beat in your story is the set-up. This is where the reader is introduced to your character in his regular world. The purpose of the set-up is to show your character’s normal life, before it’s turned upside down. It’s Bilbo sitting on his doorstep blowing smoke rings, seemingly happy and content until Gandalf shows up. It’s Katniss going about her everyday (albeit sucky) life prior to the reaping. The point of the setup is to show the reader that while the character may seem to be content, something is missing. There’s something about him or his world that needs to be corrected if he’s going to be truly happy and satisfied. According to Snyder, the catalyst should fall roughly 12% into your story. This statistic is a beautiful thing because you can take it as a loose guideline or you can swear by it, whichever fits your style. If you want to go crazy, look at your overall page count, get out your calculator, figure out where 12% is, and get your catalyst as close to that point as you can. If your windpipe is closing off just thinking about that, then eyeball it. Make an educated guess and go from there. This structure will give you a good idea of where to start your story because if you know the catalyst should start at roughly the 12% point, you’ll know how much set up should come before. Have you got too much? You’ve started too early and need to cull some of that to start your story a little later. Is there not enough set up? You’ve started too late and readers won’t have that necessary view of the character in his regular world. Start a bit earlier. So, to recap: 1) know your set-up and catalyst, and 2) include enough set up so the catalyst falls roughly 12% into the overall story. If you strive for this, you’ve got a great shot at starting in a place that’s not too early and not too late. You might not get it right the first time, but you’ll be pretty close and will likely avoid having to rewrite the opening multiple times. I’ve found this method to work really well for me. If you struggle in this area, give it a shot and see if it helps. 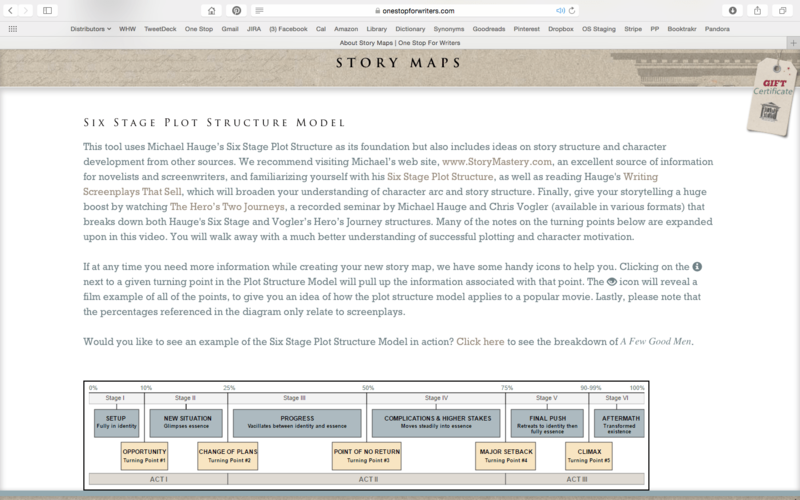 I should also point out that One Stop For Writers has an excellent Story Maps tool that allows you to lay out ALL the major turning points in your story. So if you find structure overall to be tricky, it’s worth checking out. This entry was posted in Openings, Uncategorized. Bookmark the permalink. Ok so… the bulk of the story takes place with my MC as an adult, but there are a couple of necessary childhood events to include. Essentially, she’s removed from her own culture as a child and placed in another one. Do you think it is (necessarily) a problem to open the story with her as a child, summarize the passage of time somehow, then, within the 12% range, the “main” story begins with her as an adult? I would really like to avoid both prologue and flashback if possible. Hi, Angela. You’re exactly right—in that situation, you have a prologue. You would be opening with the wounding event from the past, then fast-forwarding into the future, at which point her life has changed drastically. Prologues can be done, but they’re really tricky and not always well received; my advice (for what it’s worth) is to avoid them if possible. The question to ask is: why do you feel you need to start with that? If it is just to gain reader empathy, there are other ways to do that. Figure out what you’re hoping to accomplish with that opening scene and see how you can achieve the same thing without it. If it’s possible to start with your character in the middle of her current story (rather than in the past), I say go for it. Good luck! Do you think you could implement paypal as a payment option? Hi, Meg. When we first set up, we investigated the different options extensively and decided that Stripe was better for us than Paypal since it’s actually more secure and is used by many large corporations (including Apple). I know this can be inconvenient for those not wanting to use a credit card, but I can assure you that checking out with Stripe is absolutely secure. And if you’re not comfortable keeping your card on file, it can always be removed after subscribing. If this doesn’t work for you, I completely understand, and I’m sorry that we’re unable to offer other methods for payment. This post has such great information in it! I am currently querying my second novel, and I had an R&R request from an agent. While working on the revisions, the #1 thing I changed was the first chapter. At first, the entire first few pages were a lengthy info dump describing the world of my characters. From first draft to finished draft, I must have changed the intro half a dozen times before I finally got that “sweet spot” beginning. It is such a hard thing, and finding the balance is a struggle. Helpful tips like these are so great! 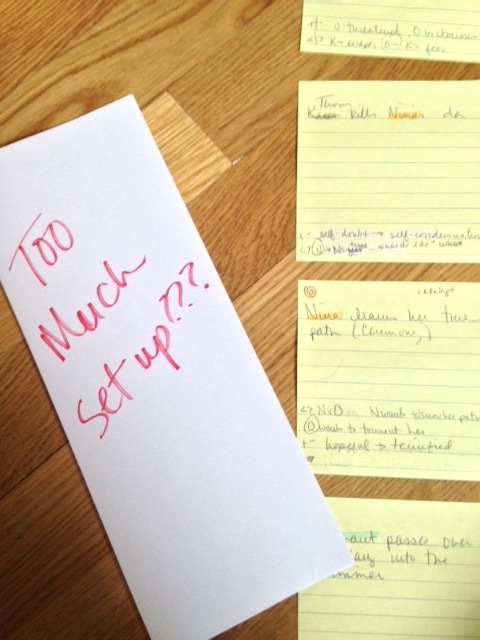 All of this came from my own struggle with the constant rewriting of my openings. I’m glad the tips are making sense for you :). I found the information in this article very helpful. Thanks for sharing. So glad it rang true, Sharon. Thank you so much for this!! I just finished judging a contest and a lot of the entries I read started way too soon with info dumps and boring day to day life. I kept wondering when the “real” story was going to start. I know you need a bit of a set up to avoid reader confusion but that’s all. So reading the entries really helped me to understand where I need to start my stories. It’s amazing how critiquing other people’s work can help us zero in on the problems in our own manuscripts, isn’t it? Jim, excellent advice (as always). And Becca, thanks for hosting this important bit of help for writers. Merry Christmas to you both. Hi, Mary Kate! I’m so glad this post was timely for you. Regarding the other turning points, there are so many tools you can use to plot these out. Save the Cat, which I mentioned in the post, has a great Beat Sheet for planning the major points in a screenplay or novel. I use it A LOT, and it’s really helped to shore up my structure. We’ve also got a super Story Maps tool at One Stop that allows you to do the same thing. It’s based on Michael Hauge’s 6-point plot structure, so the terminology is a little different from Save The Cat (as it is for all the different structure tools). You can find some information on it here. These are just a few of the practical tools available; I’m sure one of them will do the trick :). Since i’m close to The END of my first novel, I’m saving this post for my next one. Will need to be reminded of this all over again. thanks! And “finishing strong” is the other needful topic!